You need to answer the question for your entries to be valid. Great competition, thanks Jenna. I would love the Slim+Trim App. I've been trying to shift 1.5 stone for a long time so hoping that Slim+Trim could be just what I'm looking for to finally get to my goal. I would choose the Slim +Trim - I really need something to give me a push to get up off the sofa and shift the spare tyre!!! Bikini hot, I still have time before I jet off to get bikini body ready!! I would choose 'Goodbye Baby Bump' as three pregnancies have taken their toll on my fitness, and in turn my confidence too. Bikini hot - so that i can look better in 12 weeks! The slim and trim, I have lost a huge amount of weight but still need to lose a bit more and firm up. Slim +Trim, i really need to loose some weight and mega tone. Goodbye baby bump, I really need to loose my baby bump once and for all its been over a year since I gave birth now. Slim and Trim would suit me well - we all want to be a bit slimmer! I would love the slim & Trim - i need to get back in shape and this would help tremendously! I think I'd go for the bikini hot one. 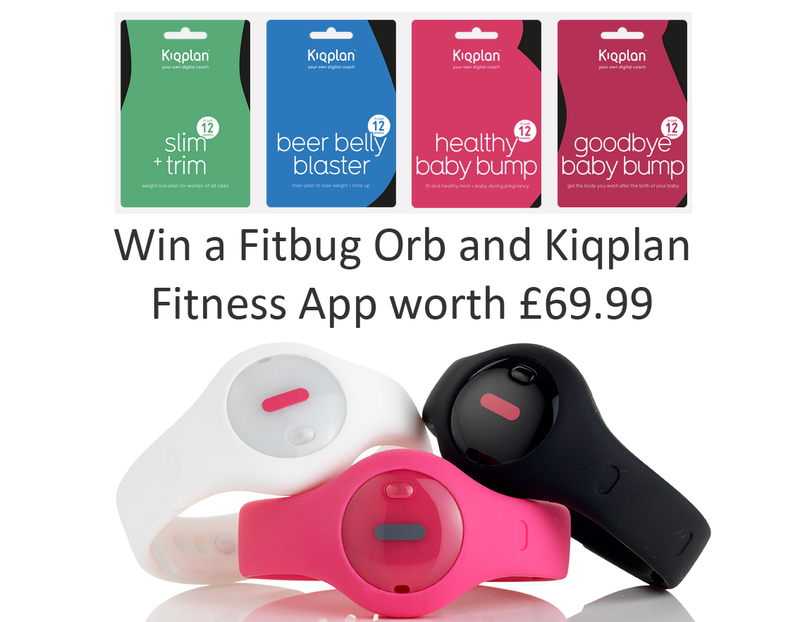 Eek, such a great comp - totally need a fitbug in my life and some motivation. :) I have everything crossed. I would choose the 'Goodbye Baby Bump', My 'baby' is 16 months and I still have a lot of wait to lose. I'd choose the Slim+Trim. It sounds like something that would fit in with my lifestyle and give me the motivation to keep keeping fit. all done would love to try!!! Suns Out Guns Out - I'd like to tone up a bit. I would love to win any colour, but especially black! I would also love the slim & trim, as I need this in my life - sounds fab! Have popped over to their website too. Slim and Trim as its exactly what i need to keep me motivated. Bikini Hot because I'd like to be bikini ready! I would choose healthy baby bump because it is important for me and baby to be healthy! I would choose Sun's Out Guns Out as then I can use it but so can my hubby - and as I'm a keen Body Pumper it will give me a workout when away! the Slim +Trim i really would love to get toned. The slim and trim, I've got a few extra pounds to lose! slim and trim, i've piled on the pounds over the last couple of years and want to get back to a comfortable size 14 before i'm 30. Definitely the slim & trim - I really need to tone up my wobbly belly. the slim and trim. got a holiday booked for 6 months time and I need to tone up loads. I would choose slim and trim. I'm already working on getting healthier and have dropped three dress sizes so far so more toning information would be great. Bikini Hot - I go away in August and this would be perfect! Beer Belly Blaster, to remove the wight that I have put on. The 5Km one because I want to build up some stamina for running. Slim and trim because it would enable me to keep fit as well as trim! Slim & Trim - I've lost 7 stone, but my belly could do with toning up. The 10k run as can run 5! Slim and trim, although if the beer belly one is suitable for women too then that one might come in handy!!! I would choose slim and trim. I'd choose the Slim and Trim - only because there isn't one called - shed another persons worth of weight! Slim and trim, I NEED TO GET TONED! I would choose Slim & Trim because as 42 I need all the help I can get to be a yummy mummy instead of a chubby mummy! I would choose Slim & Trim. I'm not overweight but I could do with trimming up a bit. I would chose 10k run ready, as I ran a half marathon in march and haven't ran since, so need to get my fitness back up!! Slim and Trim - sounds like a great all rounder. I'd choose the Slim + Trim - it's definitely what I need! I would choose your first 5k because although I'm already slim, I'd love to be fitter and have more energy! Id choose the bikini body one. Guns for me! Trying to build some arm strength as Dylan is getting heavier to carry around! The slim and trim because I need it! Slim and Trim seems most suited to my situation as I am focused on weight loss and toning. Slim+Trim because I'd really like to be! Hmm Its between 'goodbye baby bump' and 'slim+trim' .. poss even 'bikini hot' - I've still got a baby belly to get rid of but also could do with a general fitness shake up! I was going to say to the Beer Belly Blaster, but it's designed for men, so it'd be the Slim + Trim because I need to lose weight and tone up my flab! Suns out, Guns out - just in time for summer! Beer Belly Blaster - To Much Junk Food! Slim and trim so I could get down to my ideal weight and (the difficult part) stay there! The Slim+Trim. I need help losing 2-3 stone! Slim and trim - I've lost a stone but could use some help shifting another! The slim and trim because I could do with toning up! I have lost some weight and still trying but the The slim and trim would be fab. Bikini hot so I'm beach ready! Slim + trim as although I'm not overweight, I'm somewhat *ahem* jigglier than I'd like to be. Slim & trim - only by tracking progress and having regular prompts can I keep motivated. Slim and trim as it sounds like the one suitable for me! I would like to have the Slim + trim app. I would love to get my confidence and figure back. Plus this sound gadget and app sounds brilliant! The slim+trim, because I'd like to get more toned. wow this looks good.......... need to be toned. Slim and trim - as I'm massively unfit and need to lose some weight! I'd choose the goodbye baby bump app as I've had 2 kids and still look pregnant!!! I would choose the healthy baby bump one as I'm 20 weeks pregnant and would love to make sure I'm healthy and fit for when baby arrives. I would choose slim + trim because I've been diagnosed with type 2 diabetes and I really need to lose some weight. Would have to be slim + trim! Your First 5K, yes I am one of those who needs to be taken from the couch and built up slowly! I'd go with 10K run ready because I'd really like to get back into running. It would have the added benefits of toning me, lowering my stress levels, and improving my eating and sleeping. Slim and Trim. This is just what my body needs. Slim + Trim - I'm trying to lose weight at the moment this would be fab. I would choose bikini hot - to help get me ready for my wedding. I would like to try the bikini hot, I have a bikini but don't have the courage to wear it. Would love it get into running, so think I would choose the your first 5k programme, this would motivate me to actually start running and get fit. I would choose the Slim +Trim ! i need to be slimmer and trimmer lol ! 10 k, im on a mission to get good and enjoy running! Bikini hot ~ just a help to tone up to brave the bikini!! suns out guns out, because i really want to show off my arms this summer! Bikini hot so that i can look better in 12 weeks! Slim and Trim would be the best for me. I'd choose Slim + Trim because I think it would be the most practical for me, and I love the all round approach - including sleep!